Interpine has been working with LiDAR ground control survey for several years now. To ensure that the LiDAR data is compared correctly with the ground control measurement data, high precision sub-metre GPS units are used to fix the location of the plot centres (Trimble ProXT GPS Units). Combined with the Allegro MX or Trimble Nomad handheld computers and Terrasync software these units collect detailed location and GPS satellite network information while onsite. This allows the data to be “post processed” bringing the accuracy of the plot centre fix in optimum conditions to less than 1m. However we all know the forest is not the easiest place to operate high precision GPS units so I thought we might share some our findings and suggestions. The project objectives were to geo-fix the plot centre locations within 2.5m. After some trialling of the Trimble ProXH (sub-foot) and Trimble ProXT (submetre) units, it was decided that the most economical and all round unit to meet the project objectives was the ProXT. The ProXT is rated for sub metre accuracy in clear open. To assist the collection of data, the ProXT was raised 5m above the ground to clear shrub material. Initial trials in tough conditions indicated that 300-500 data points should be collected based on attempted cycle of 1/sec (ie min 5-10mins of data collection). In reality to gather this number of points took between 20mins to 3-4hours depending on the site conditions experienced on the day. Forest conditions ranged from dense shrub land, to young and old pine plantations throughout NZ. On review of a winter season worth of permanent sample plot installations (some 320 sites), we were pleasantly surprised to have over 50% of the sites reaching the sub-meter accuracy expected of the ProXT units. In all 98% of sites meet the objective of being fixed to within 2.5m (see figure 1 for more detail). Figure 1: Horizontal Precision of the GPS site fixes gathered from 320 permanent sample plot locations spread widely across all forest types, topography and undergrowth conditions within NZ’s planted forest estates. **note field crews also carried a lower grade GPS unit, whereby after 3-4hours attempting to fix a site with the ProXT, they would then move to the Trimble XB receiver (3-5m) which would still allow for post processing at a lower level of accuracy. This accounted for around 1% of sites. All of the sites where the XB receiver was used make up the >15m horizontal precision shown above. 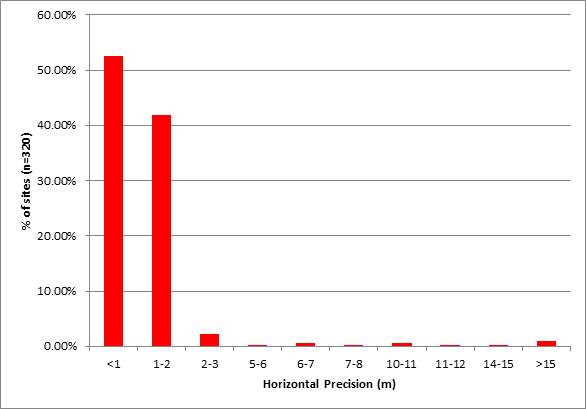 Precision HPE displayed is based on 68% precision level.